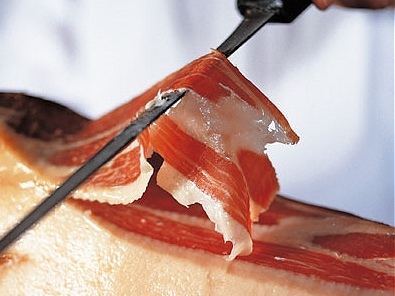 Jamón Serrano ham is the culinary treasure of Spain. Spaniards enjoy more ham per person than anyone in the world. 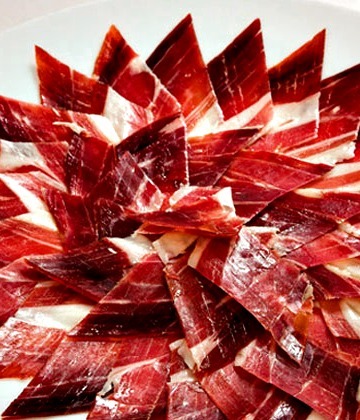 A whole jamon can be stored in your kitchen and used daily as tapas or in recipes. It is also a great conversation piece for parties and get-togethers. 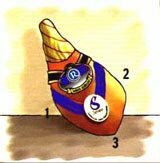 To enjoy the flavor and authentic texture of a fine jamon serrano, slice the ham with a long sharp knife in the following order: first the rump half (1), then the rump end (2), and lastly the shank (3). Remove the layer of fat from the top and the sides until the meat is exposed. Trim the fat as you slice. Cut small, very thin slices. Slice downwards with your free hand behind the knife. Mastering the fine art of slicing Spanish Ham Book:If you long to slice ham like the professionals, this beautiful and informational 'how-to' is a must-have addition to your cookbook collection. With gorgeous, mouthwatering photography on every page, this delightful read is perfect for display on coffee tables or propped on shelves. The practical minded and frequent slicer should perch it on cookbook stands permanently for quick and easy referencing at a momentÕs notice. It also makes an attractive and functional gift for the professional or amateur chef in your life. Store bone-in jamon in a cool ventilated place, either in a holder or hung by the rope provided. Always cover the sliced area with plastic wrap to preserve freshness and moisture. The first slice should be discarded if the meat has been exposed for some time. Store your boneless jamón in the refrigerator, wrapped in plastic. Boneless hams can be divided into pieces, or can be sliced on an electrical slicer. Serve the jamon at room temperature. Mold: A thin layer of mold may appear on whole hams. This penicillin-like mold is completely harmless. It can be removed with a clean, damp cloth or with a cloth and olive oil. Small white spots (thyroxine): These are small "chalky" granules that form between the muscle fibers during the curing process. They vary in shape, size and location. They are amino acids found in aged meat and cheese products and are perfectly safe to eat. Iridescent colouring: This colouring can be seen on the cut surface of the ham and in certain parts of the meat. The colouring sometimes has a metallic appearance. It is insignificant as far as the quality of the ham is concerned. Salt: Sometimes saline precipitates may form on the surface of the ham in dry conditions. This inorganic salt does not affect the flavor of jamon and can be brushed or wiped away. White film: This may be seen on the cut surface of whole or boneless hams. The film is mostly thyroxine (same as the white spots). Simply discard the discolored slice. Fat: Whole hams tend to be rather fatty, which protects the meat and helps it keep longer. Jamón Iberico hams are marbled with rich golden fat, infused with the flavor of its favorite food, the acorn. Sliced paper-thin, it has a rich nutty flavor and tender texture. Jamón Iberico is the pride of Spain, and Spaniards consume the vast majority of these hams in their own country. Some producers have waiting lists for several years for their best products.